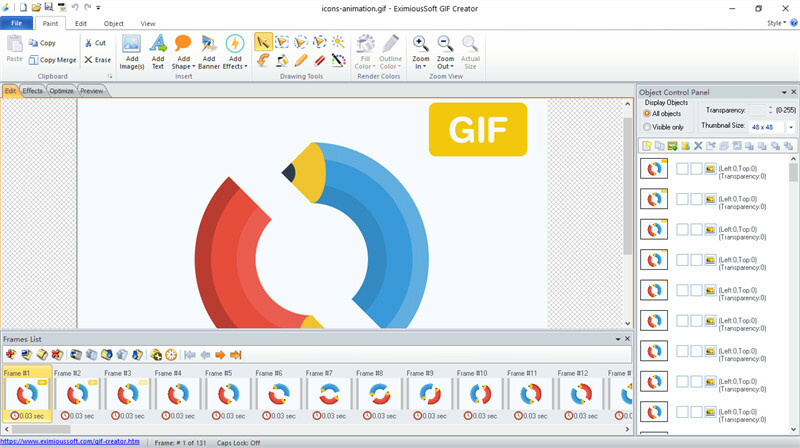 EximiousSoft GIF Creator 7.38 Free Download - A powerful tool for creating high quality and impact GIF animation. This program comes with dozens of special transition effect. Only by some simple mouse clicking, it can help you make out amazing animations or banners within short time. EximiousSoft GIF Creator is also a powerful image editor. It supports full WYSIWYG layer editing. You can combine a rectangular selection box, an elliptical selection box, a lasso tool or a magic wand selection tool to select a region of particular interest on the image. Then copy, move, copy the image of the area or apply filters conversion effect. The &quot;Transform&quot; tool makes it easy to move, scale, rotate, etc. the drawing object. The &quot;Erase&quot; tool removes unwanted portions of the image at the pixel level, making it completely transparent.